Join the Southern California Chapter of APHA as we welcome Paul Moxon for a talk about the Vandercook and other brands of hand-operated flatbed cylinder presses and their transition from essential printing plant equipment to their repurposing as a highly desirable book arts tool. 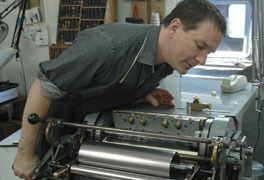 Paul Moxon is a studio letterpress printer, itinerant teacher, and author of Vandercook Presses: Maintenance, History and Resources. He is also website editor in chief for the American Printing History Association, a recent Newberry Fellow and a former Rare Books School Fellow.